Look below to see a map to our location. Feel free to call if you need any additional information about how to find us. 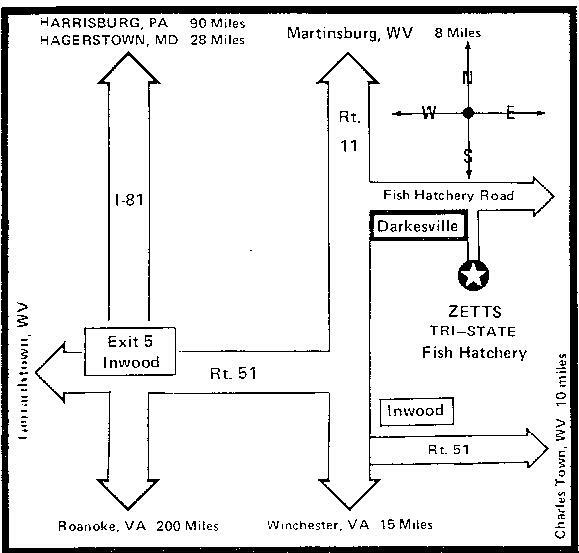 Our hatchery is conveniently located off of Interstate 81. The hatchery is located off Exit #5 Inwood off I-81. Once you get off Inwood Exit #5, take Route 51 East 1/2 mile to Rt. 11 North 1 mile. Sign on right in Darkesville. We are located off Rt. 11 at town of Darkesville 8 miles South of Martinsburg, WV and 15 miles North of Winchester, VA.